We’ve all been there right? A company advertises their product as “free”. You get all excited and run out to their site to sign up. You provide your name and email address, maybe even a bday, no big deal. Then you hit next only to find that they want your #$(%&*$ credit card number! Why? Why do companies do this? They are CRUSHING their onboarding conversion potential! This is the LAMEST UX on the face of the earth. Other than, you know, nuclear reactor buttons being poorly arranged. Horrible practice though, seriously, especially when your target audience is even remotely tech savvy. 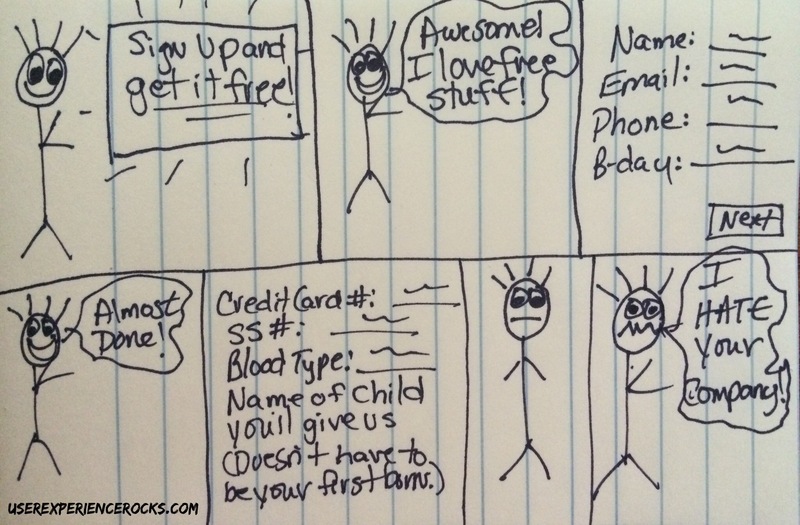 You need to gain user trust before folks are going to fork over their credit card numbers. By asking for it too soon in the workflow you alienate people who could have become paying customers over time. Not only did you alienate them, you just completely obliterated any semblance of brand trust that could have existed straight out of the gate if it weren’t for your shady, lame onboarding UX. So in a nutshell: Stop it. Right now. If you’re guilty of this, fix it. You’re brutally murdering your company’s sales potential at the very first user touch point. Because nobody cares about onboarding conversion. Sales conversion is what matters. If sales conversions happen once a user is inside your product, crappy onboarding will completely destroy your sales conversions. It will also lead to user frustration which will trigger high turnover, and fewer renewal rates. A lot of companies don’t realize the impact that onboarding experience has on their bottom line.